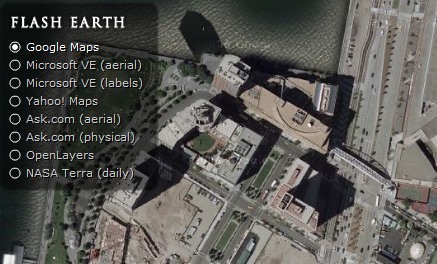 Flash Earth is a cool site that lets you enter a location and compare the imagery from Google Maps, Yahoo Maps, Windows Live Local, Ask.com Maps and more. The site uses Flash, but it doesn't appear to be using official APIs to load the imagery. I like Flash Earth better than Google because it gives you a full screen view plus a variety of photos. I’ve gone back to all the places I’ve been in the world plus a bunch of places I would like to go using it. The only problem is that in “Google maps” if you zoom into a foreign country to close it blocks you out then keeps you blocked from going anywhere.